Note: I started writing this a few days ago but was interrupted, and then I didn’t want to work on it over my birthday weekend because it’s not the most uplifting topic. But here goes. 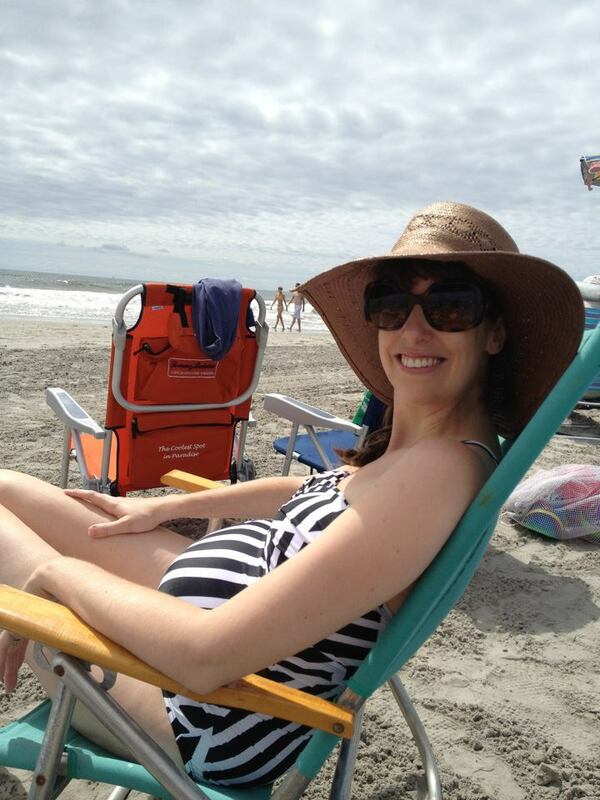 Most of the time I am very relieved and happy not to be pregnant anymore. Mainly, of course, now there is Lucy, and people were right when they told me I would soon not be able to recall life without her. And even though I had a healthy and relatively easy pregnancy as these things go, I was pretty darn uncomfortable toward the end — I became way too acquainted with sleeping on the couch propped up with an assortment of pillows. I got tired of not being able to see my feet anymore and not being able to put on sneakers without much difficulty. (At least I don’t live in a cold climate — my sister–in-law had to have my brother-in-law put on her snow boots for her!) We had an unusually hot fall with 90 degree temps as late as October, so my desire to live in stretch pants and huge sweaters was not fulfilled until very late in the game. Loving my cute tummy on the beach. I thought I was mentally prepared for new-mommyhood (or at least, prepared for not being prepared). As it turns out, there are many things I wasn’t truly prepared for, but a big one was the way my body would change. I knew it would take a while to get back to normal but I couldn’t bring myself to even imagine that my body might change permanently. Beyond the effect on my lady parts, which I won’t get into, my figure seems to have done some real shape-shifting. I guess I’m lucky in that I pretty much only gained weight in my tummy and hips (no double chins or cankles, thank goodness), so I dropped a significant amount of weight post-baby. But now, I’ve reached a plateau and have come to the harsh realization that I won’t be able to get back to any semblance of “normal” — if at all — without some serious work on my part. As mentioned previously, I am not and have never been a workout girl or someone who watches what I eat, so this all feels pretty daunting. I’ve also realized that before Lucy, I think I went around sucking in my stomach 24-7. During pregnancy I didn’t have to do that (yay!) and so now, I forget (and my stomach muscles forget how, even if I wanted to!). So, I’m at a weird limbo with my clothes. The dreaded maternity pants no longer fit, but neither do 99% of my old pants. I’ve started ordering new jeans in the next size up. I can’t decide if it’s better to accept that my body’s changed and buy all new clothes now, or to keep the old jeans in my drawer as a carrot to entice me to try to get back to my old shape. I don’t want to give up, but I also know that I need to learn to love my body the way it is. I try to look at myself in the mirror — imperfections and all — and tell myself that my body is miraculous. After all, I grew and gave birth to an amazing little person! And most of all, I don’t want Lucy to ever grow up hearing me complain about my body because I don’t want her to internalize those same insecurities. But I must admit it’s hard to accept a “normal” post-baby body when I see women (ranging from celebs to my own friends and co-workers) who seem to be able to return their bodies to its former status. I know I’m not alone in these feelings. But here is an awesome article that I try to think about when I’m feeling blue about my body. It made me tear up when I was pregnant, and even more now! No matter what, I am trying to remember to stay in the picture.